To some, one of the greatest luxuries in life is long drives on open highways in nice weather. To others, long drives can be irritating. Regardless of who you are travel is something that, for the most part, can’t be avoided at one point in our lives. Whether we are vehicle owners or renters or even just passengers, we must take the proper precautions. If you think about your home and your work, we probably have some sort of medical kit available to us. Even if it’s just band-aids and a bottle of rubbing alcohol, we have something to take care of us in case of an urgent situation. Not many of us, however, have urgency packs in our vehicles in case of an emergency. Some people carry around jumper cables but what happens if there is a crash on a deserted road? Or if in an area of low to no reception? We don’t usually think that far ahead. There are several urgency kits available online, however, they are less specified for vehicles. We rolled up our sleeves and did some digging into vehicle-specific roadside assistance packs and found the best (and most useful) ones on the market. We get a little bit more into the criteria we used to choose these packs but for the actual reviews, we went through real customer ratings to pull the items that were not only the most useful but the most sought after. We didn’t just want the good either, we also wanted the ugly. We looked for both the pros and the cons of each and highlighted the best features of each pack, as well as found the top 3 products on the market today. We want you to be safe when traveling. These products aren’t just for vehicle owners, they are for anyone traveling in a vehicle. Like car insurance, it may not seem worth it now, but you will be very happy you had it when in an urgent situation. They also do not need to cost much. We have provided a wide range of products both in items included in each but also in price. So without further adieu, here is the best roadside assistance products on the market today. 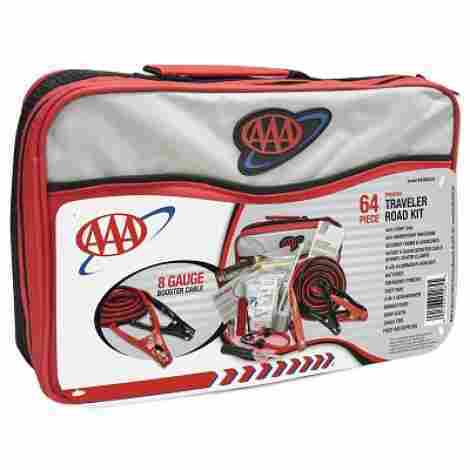 This roadside assistance kit comes with 64 pieces and is our Editors Choice. It is a compact product and was specifically created by AAA (the Canadian equivalent of AAA is the CAA). AAA for those who don't know is a major company that provides roadside assistance for a paid membership. They know what is needed in order to make sure you aren't stuck in a sticky situation. It includes both roadside assistance as well as a first aid kit. This kit includes multiple useful items but probably the most valuable is a guide about what to do if in an auto accident. This is a step by step guide on what to do in the moment. This product not only includes items to take care of your vehicle but also to take care of yourself which will come in handy if in an accident. This product is mid-range in price compared to competitive products. You are paying for the assurance that everything you need is in this kit and that the kit was put together by professionals. This is the justification for the price. This "little" kit isn't so little. Everything fits in one small carrying-case but this kit is loaded with everything needed when in an urgent situation. It is an 81-piece kit including everything from a poncho for the rain to glow sticks for when it is dark. It even comes with a little mini air compressor. This product is one of our Top 3 products. The mini air compressor included in this kit is really small (it fits in the carrying case) and is meant for flat tires that can be temporarily filled up until you get to a mechanic. This is super handy especially when a spare tire replacement isn't an option. We can't even list all the items in this product without getting tuckered out. It has a cone, spare spark plugs, jumper cables, a multi-purpose tool, gloves and a pylon. This product didn't miss a thing and the bag it comes in is compartmentalized making it super easy to put everything together and away. The one set-back with this product is that it's quite expensive. It's definitely on the higher end in price but for a good reason. If living in Canada and facing the Canadian winters, this product is for you. 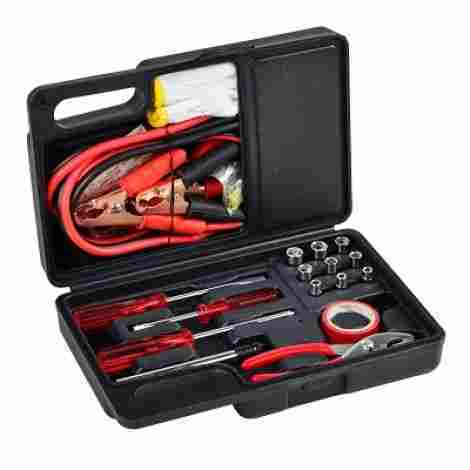 You will not have to worry about a flat tire or a dead battery with this kit, it will cover nearly everything. This is also a fairly large pack but the advantage here is that it is very inexpensive considering what it holds. This is the one we recommend for individuals on a budget and this is why it is our Best Value item. This pack includes all sorts of items including a huge first-aid bag. It also includes ponchos and jumper cables. It will cover but personal injuries and vehicle issues. 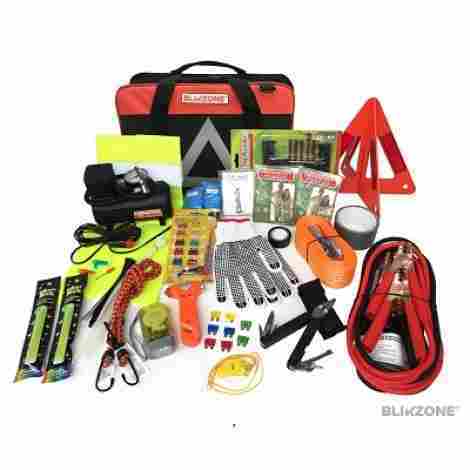 This roadside assistance pack includes both a reflective vest and reflective cone. This will be very handy for those who travel frequently at night and those who travel on curving and roads over hills. The first-aid bag is quite extensive in this pack. It has just as many first aid items as it does vehicle repair items. This product is inexpensive in price considering everything it has. The pack is ideal for people on a budget, those who drive often at night and also for individuals traveling in colder climates (the pack includes breakable warming packs and emergency blankets). This roadside assistance gear is made by the Well-Strong company. It is a 66 piece unit almost entirely dedicated to quick vehicle repair. It, like all the other packages, includes jumper cables and a first aid bag. It also includes a safety vest and a reflective triangle (or pylon). This product comes with quite a few items but it all fits compactly into a small carrying case. This is better for people with smaller vehicles or people with limited space. Not only is this kit small but it is really easy to sort through. Each item is labeled to let the individual looking through the bag know exactly what they are looking at. This will help with saving time when in critical situations. It also helps those of us who aren't entirely mechanically inclined to find exactly the item we are looking for. This product is very inexpensive. It is the least expensive product in this article. This is ideal for those on a budget, with little room in their vehicles (or own a small vehicle) and the less than mechanically savvy. This is a roadside assistance pack lite. It is a basic pack meant for quick fixes without all the bells and whistles. This product is ideal for someone looking for something slightly above just jumper cables. 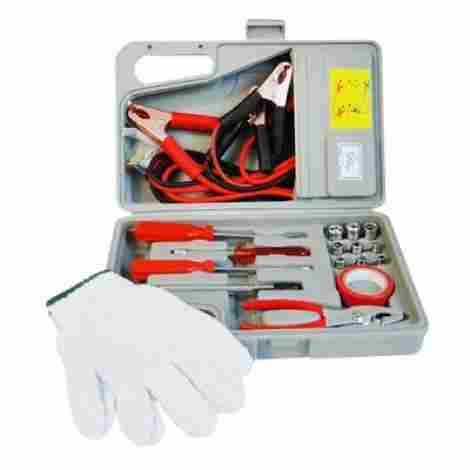 It is quite inexpensive and comes in a hard, durable plastic tool case. This product does not have all the bells and whistles of the other products. It is meant for a quick fix when doing minor traveling not far from home. It includes some gloves, a socket wrench, a couple screwdrivers, jumper cables and some tape. This product is small and will literally fit into any vehicle no matter how full. It is inexpensive and includes just the basics. This unit is very inexpensive. It is great for people on a budget and those who don't do a lot of far-away driving. It wouldn't be ideal for those who leave the city but would work well for city driving especially for individuals with vehicles that often find their battery dead. Plus the jumper cables aren't just sprawled out in the trunk, this case neatly packs them away for both appearance and care of the cables. This is a slightly physically larger emergency pack from Roadside Rescue Emergency Assistance Kits. It comes with 101 pieces and is meant for those who travel quite frequently. It includes both a full safety-pack and a full roadside assistance pack in one. This is another product that would probably be really good for new drivers. This is meant for people who drive quite frequently or even those who are professionals in assisting in roadside assistance. It includes so many items including more intensive items like a towing rope and bungee cords. This product is meant to not only get other drivers attention but it is also going to get you through the night. It has all the reflective gear needed but also includes a magnesium fire starter set, an emergency blanket, and a 9-in-1 multi-tool. This product is actually surprisingly inexpensive considering what is included in the pack. It may still be too expensive for individuals on a budget but considering it has 101 pieces, it still sits in the middle of the price range. Considering everything included in this bag it is definitely a great bang for your buck. This is also a smaller product with just the essentials. 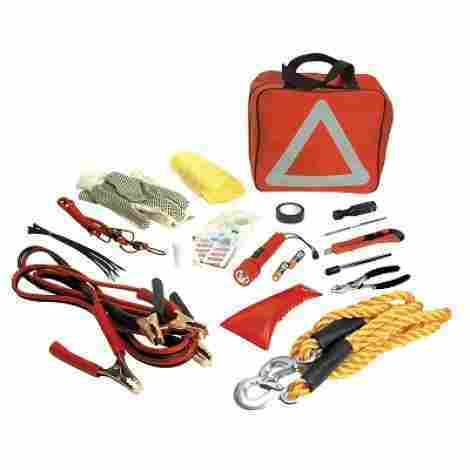 It includes the standard towing rope and jumper cables but also has a couple extras for everyday needs. This product has everyday essentials too including an ice scraper, jumper cables, and a flashlight. This comes in handy when driving a small car and can be your primary pocket ice scraper. This product is pretty inexpensive but it still includes a first-aid kit, common tools like a pressure gauge, a box cutter, and pliers. This is a great intermediate product with a very low price tag. This would be great for SOME out of town driving and is a good little starter kit for first-time drivers. This is another product from Performance Tool. 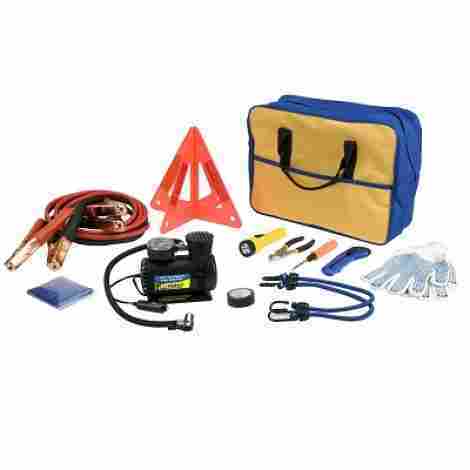 This pack is a little more vehicle repair focused and includes a mini air compressor.The case is a little bigger than the previous performance tool product and is a little more jacked up for more intensive situations. This product, like the Blikzone kit, includes a mini air compressor which really comes in handy for flat tires (or even camping) if required. This does not include much for survival material but it is a slightly elevated version of simple packs. This is also a great gift for first time drivers, especially those who have to drive out of town a fair bit. This product is mid-range in price. It includes a mini air compressor and this is probably the majority of the cost. It also comes with 12 other items so you are getting what you pay for with this case. Again, if you are an individual that often finds themselves with flat tires, this one is the one for you. 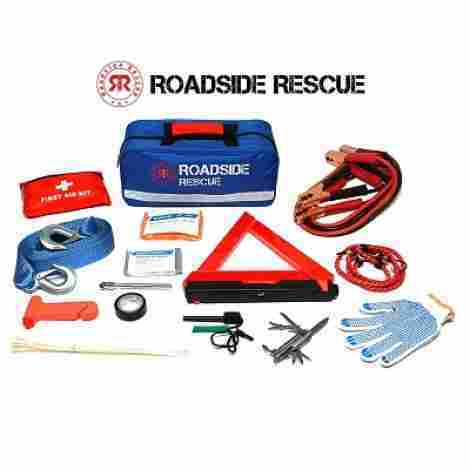 This roadside assistant pack is another small and basic kit. It includes just the basics of what you need and may serve more as a cable organizer for your jumper cables than anything. It also comes with a hard, durable plastic case and is ideal for smaller vehicles and city drivers. This kit includes about 30 pieces. It has your standard jumper cables and mini-tool kit. This product comes with a lifetime warranty which will come in handy with the jumper cables. Not only are the safely stored away in the hard casing included but anything that happens to them outside of the casing is covered. This should put any buyers mind at ease. This is slightly more expensive than the other similar product in this article, however this product comes with a lifetime warranty. It is also black in color, if that is a preference. This roadside assistance kit was thrown in for fun. This product comes in all pink and is ideal for all those who love pink! It not only comes in a fun color but is also pretty handy. It comes with all the essentials needed for roadside assistance and comes in a cute, sturdy pink bag. This would be great the as a gift. It is also cute and compact. The design of this bag is interesting because the reflective triangle is stitched to the side of the bag. This will save room in the bag for the rest of the tools available and extra if needed. This product is a little expensive because it is slightly novelty. It does come with everything you need including jumper cables, ponchos, gloves, a flashlight and more). It also comes with a lifetime warranty and this alone is justification for the price. In conclusion, when driving on any road a driver needs some sort of roadside assistance pack. Even if it is just driving around the city, there are packs simple enough to help you in sticky situations. We hope that this article was informative for you and helped you find the perfect product for your needs. Safe travels! You want to know what is included in your roadside assistance pack and what it is you need it for. These packs range from 10 items to 100 items and price usually increases the more you get in the pack. If there is more in the pack and the price is low then you are probably getting products that are cheaply made (otherwise how would the manufacturer make money?) so you want to make sure that the items you are getting are covering your needs without going too far above them. There will be situations where you don’t realize you actually do need something but consider your route and what could happen and purchase based on those needs. You should be good with all scenarios considered. What is included in a roadside assistance pack is almost always jumper cables. A dead battery is the most common issue you are going to have with your vehicle that is usually based on human error or leaving a vehicle sitting for too long or in too cold of an environment. The other items in the pack should at least be some cables that can strap an object in and some gloves. Reflective products are handy too when in the dark as this will prevent another vehicle from hitting you due to lack of visibility. The reflective gear will also help when traveling on hilly roads. A first-aid pack should also always be available to you. Whether or not it is included in the pack (though most of these packs do have them) a first aid kit should be available. But why deal with the extra work (and space) when buying a whole separate first aid kit? You might as well spend the extra money and buy a pack with a first aid kit included. Reflective vests are also handy especially on busy highways where working on the vehicle requires you to be close to the road. Plus a moving reflective object will draw attention to other drivers far better than a stationary one. Some packs will have gear that is meant to keep you warm like breakable heating pads, blankets, and candles. These packs are ideal of those dealing with colder winters and evenings. Other packs will include more survival type stuff like magnesium fire starter packs, glow lights and multi-purpose utility tools. These packs are ideal for those who travel in areas of lower traffic and in nature. The climate will dictate which pack is needed and we wanted to provide different products for different situations. Consider your environment and path before purchasing your pack because having glow sticks by not be necessarily needed when a bandaid is (for example). The location where the manufacturer is may impact the quality and the experience of the company. You may want to consider products that are made locally because you know that local will know your environment. The experience of the company will be helpful as well because you will know they went through the trial and errors of the products made have passed. If the company is still standing after criticisms then you know they have improved their product. Additionally, the experience will also help give an idea of the longevity of the business. You want a business that will stand strong with their warranty promise, not one that will go under in a week. The quality of the materials being used is important. Even though you won’t need to use these too frequently (or so we hope you won’t), you want to know that when you ultimately have to use them that they will work for you. Especially because these products are meant to be used in urgent situations, you do not want to end up in an urgent situation just to find out the product (that you spent money on) is faulty. We want to make sure that the product is good quality, that all the power needs are supplied and that they will not fall apart after long periods of not being used. A new driver and a mechanic will need very different things when using these packs. Someone who does roadside assistance for a living will also need very different things. The packs we included in this article go anywhere from starter to advanced and basic to extensive. We wanted to cover all bases for everyone looking to buy one of these packs. In addition, as mentioned in the area about conditions, the route will also dictate what will be needed. Price usually means quality but price does not need to dictate which you should buy. Ultimately you want to buy something that is going to suit you. If you don’t need all the bells and whistles, then don’t pay for all the bells and whistles. Like with all the other points, base your choice on what you need. We included more inexpensive packs with very little items and we included inexpensive packs with many items. You want to find the best quality for the best price that also covers all your needs. You don’t want to pay the least amount possible, end up in a sticky situation and then realize you are without things you need because you decided to spend and get less. Make sure all your needs are covered. You don’t want to end up in a situation where there is no solution especially when you did pay for something that may end up being useless. 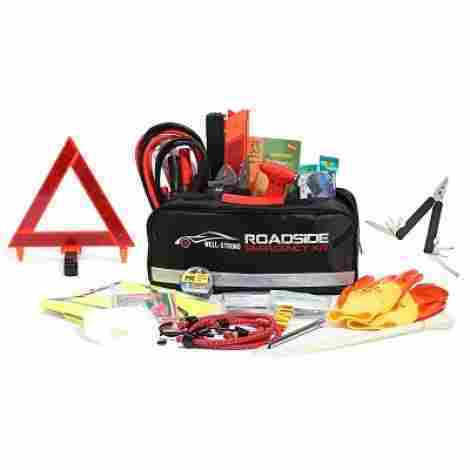 Q: What is a roadside assistance kit & what should it contain? 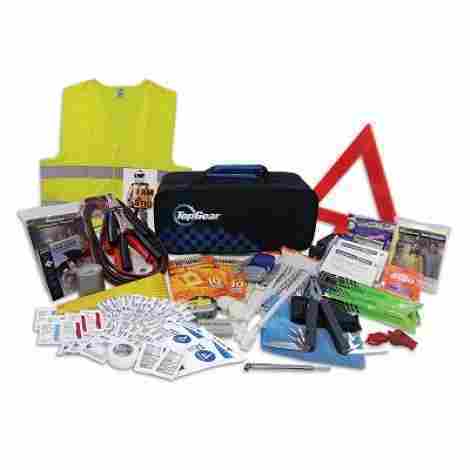 A roadside assistant kit doesn’t only necessarily focus on physical injuries. It’s like a first-aid pack on steroids for your vehicle. They typically include items like rope, gloves, jumper cables, tow rope, cones, flashlights, various tools and tape of some sort. The purpose of these packs is for if something goes wrong with your vehicle and it requires tools to get it fixed. This can be especially essential when in winter climates (even more so when living in Canada). The last thing you want to deal with is a flat tire in -40 weather (trust us). These roadside assistance packs can also include survival type items too like glow sticks, flairs, packaged blankets and breakable heating pads. There should at least be a set of jumper cables, a flashlight, and a tire pressure gauge. If in colder climates, an emergency blanket and breakable heating pads should also be included. For night time driving, either candles or magnesium fire starting kits, as well as glow sticks will go a long way. For out of town driving it is wise to have an air compressor for flat tires and some bungee cords will be helpful. Having a first aid kit as well is very wise. You always want to make sure that it includes some alcohol wipes to disinfect any cut inflicted in the situation. Q: Are there roadside assistance packs that contain food? Typically the packs with food are more survival type assistance kits. Roadside assistance kits are typically for accidents and dead batteries. If you are going on a long outdoor adventure it’s wise to also pick up a survival kit just in case. These typically will have some sort of sustenance product for long-term exposure to the elements. Q: Where should I store my pack? The small ones can be kept under seats. The larger ones will probably need to be kept in the trunk (they can get quite large in size depending on how many items are in the pack). It’s important that they are kept accessible for if in a crash and they should also not be kept under things. The majority of the packs in this article are housed in a canvas bag and the items inside the pack could get crushed if put under other items, especially heavy ones. You don’t want to need the items and to find out they are broken due to something heavy being left on top of them. Q: I only drive in the city, do I really need one? Everyone should really have one. The only situation where it MAY not be needed is if you have access to an AAA or a CAA membership. In that situation, you have a tow truck on hand however even then those memberships do not cover everything. Even a small pack should be stored somewhere in your vehicle. Q: Is there an expiry date on these packs? Not really. As long as everything is in working order you should be fine. Some of these packs include additional batteries and they may end up dead over time. Consider buying packs that are good quality and include items like windup flashlights just to be safe. It is also a good idea to test the items from time to time to make sure they are in working order.